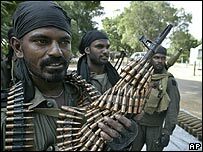 All parties involved in the war in Sri Lanka have come in for heavy criticism for disregarding human rights at a public hearing at the European Parliament. Both the government of Sri Lanka and Tamil Tiger rebels fighting for autonomy for Tamils in the north and east were blamed for "showing a brazen disregard for the well-being of civilians". European parliament members and representatives of non-governmental organisations provided evidence at a packed hearing in Brussels to gather facts on the human rights situation in Sri Lanka. An earlier session had discussed post-tsunami reconstruction. Charu Hogg of the New York-based group Human Rights Watch said that, in its enthusiasm to defeat and destroy the Tamil Tigers at all costs, "the government's respect for Sri Lankan and international law has sharply declined". The organisation also accused the government of forcibly returning some of the 315,000 displaced civilians without adequate security or humanitarian assistance in place. Deputy solicitor general Shavindra Fernando said the authorities were deeply committed to upholding human rights. He said a special committee appointed by the president had started investigating 16 prominent cases of alleged human rights violations. But the head of Action Against Hunger expressed disappointment at the progress of investigations into the killing of 17 of the organisation's aid workers in eastern Sri Lanka last year. "Things are going too slow," said Francois Danel. He also feared that there may be a trend of violence against workers belonging to humanitarian organisations. Although the government of Sri Lanka, and international and local organisations were represented at the hearing, there were no representatives from the Tamil Tigers, who are banned in a number of countries, including the European Union. "The absence of the voice of the north-east is regretful," said Arjunan Ethiriveerasingham, the Colombo director of the Tamil Rehabilitation Organisation (TRO), which is accused of close links with the rebels. "Everyone but the people who are actually worst affected by the abuses is represented here," said Mr Ethiriveerasingham. "While we should not forget the killings of the workers of the international humanitarian organisations, we need to focus on the plight of the people on the ground. "There are many local NGO workers killed under suspicious conditions. There is complete impunity for the killers. Government is guilty for not taking action," he said. 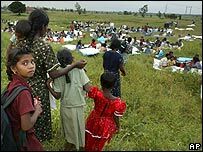 The executive director of the Consortium of Humanitarian Agencies in Sri Lanka, Jeevan Thiagarajah, said human rights standards were declining fast. He said the situation was now similar to that in the late 1980s when an estimated 60,000 people disappeared. "We are going backwards. I think it is deteriorating rapidly," Mr Thiagarajah said. For the government, Shavindra Fernando said: "We are ready to face any forum which criticises the human rights record of the government. "One of the main problems is gathering evidence against the atrocities. "Now we are bringing in legislation for witness protection. That will speed up the inquiries. We are proactively pursuing the abusers." The European Parliament is to consider the points discussed at the hearing and come to resolutions. More such public hearings on human rights in Sri Lanka are planned.